"At Last! 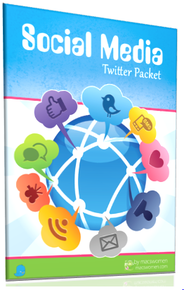 Get Your Hands On The Simplest Way To MACs-iMize Your Business Online With The Social Media Twitter Packet - for FREE!" Do you constantly dream of reaching more ideal clients using social media? Do you have a great product or service you'd love to get out to the market in a big way? Do you wonder how others are making a big impact in their business leveraging Twitter? If so - the solution you are looking for is finally here! MACs-iMize your Twitter profile - and how to create the perfect tweet! Of course, most business women don't know how to take their idea from their head to construct the perfect tweet, much less monetize this robust social media platform. But this is all about to change. The MACsWomen "Social Media Twitter Packet" is your complete manual on how to begin getting noticed on Twitter once and for all.